FOREWORD The five African Women ministers for education, fondly known as the founding Mothers of FAWE, believed that women in decision-making positions have the potential to make a significant difference. In our early years 27 years ago, our efforts were focused on advocacy to place girls’ education on the policy agenda at national and international levels. Our focus thereafter went beyond advocacy, moving towards influencing action on the ground to reduce gender disparities in access, retention and performance. Today, FAWE finds herself in a very dynamic environment where socio-political trends, particularly in the educational sector in Africa call for responsiveness to contextual changes. This would empower FAWE to address emerging issues, mitigate cause and effect of girls’ and women’s education, promote the rights and welfare of girls and women in adversity and empower them to be self-reliant and productive members of their societies. In order to remain a learning catalyst, become a facilitator of change processes and an innovator of sustainable, gender responsive interventions, FAWE will, through this Strategic Plan, seek to empower girls and women in Africa with skills, values and competencies to achieve their full potential. This new thrust around the development of skills, competencies and values has been well articulated in the vision, mission and goal of FAWE. FAWE is a thought leader on the education of girls in Africa and this strategic plan presents a world of opportunities for like-minded organisations that may be technical partners, development partners and strategic partners and significant others, to identify potential areas of collaboration and partnership that could further advance shared goals. I wish to reiterate the need for all of us to commit to exceptional execution of the 2019-2023 Strategic Plan in order to achieve the four strategic objectives by the end of the strategic planning period. Strategy execution will involve more participation, demand the consideration and integration of many key variables or activities, and require an effective feedback or control system to keep a needed focus on the process of execution over time. Diverse partners such as the governments of countries where FAWE operates, previous, current and potential funding partners as well as our research centers, universities and the private sector are urged to join FAWE in this five-year journey of the Strategic Plan 2019-2023. Welcome to the fourth strategic plan of FAWE since it was founded in 1992. The first SP was for the period 2000-2004, followed by 2008-2012 and lastly the most recently concluded (2013-2017). With the 2013-2017 Strategic Plan coming to an end in December 2017, the FAWE Africa Board declared 2018 a gap year that would enable the organisation to take stock and make reflections of the previous strategy and plan ahead. FAWE therefore embarked on an evaluation of the 2013-2017 Strategic Plan in March 2018. This entailed carrying out evaluation visits to select National Chapters while online data collection tools were used to reach out to the rest of the FAWE network. The findings from the evaluation informed the development of this strategic plan. August 2018 saw FAWE convene a visioning workshop where representatives from the FAWE Africa Board, the National Chapters, key FAWE partners and the Regional Secretariat were in attendance. Consensus was reached on the theory of change and key pillars on which to anchor the new strategic plan. The process then set stage for the draft of the plan that was then presented for validation by the FAWE National Chapters in October 2018. The 60th FAWE Africa Board Meeting of March 2019 held in Nairobi, Kenya approved the FAWE Strategic Plan 2019-2023. I hereby call upon our National Chapters to embrace the new strategic outlook of FAWE and work towards the harmonization of their respective Chapter strategies such that we synergise our efforts for greater impact in our envisioned common goal. I also urge our current and potential partners to come on board and identify within this FAWE strategy areas of shared interest which could serve as strong entry points for the development and strengthening of our collaboration as we push the African girlsâ&#x20AC;&#x2122; education agenda on the continent. We thank you for your continued contribution to the success of the FAWE network over the last 27 years and we look forward to achieving our vision and mission and realizing our broad strategic objectives articulated in the FAWE Strategic Plan for 2019-2023. ACKNOWLEDGEMENTS The FAWE 2019-2023 Strategic Plan (SP) was prepared by taking cognizance of findings and results from the end term evaluation of the FAWE 2013-2017 Strategic Plan. The SP evaluation was conducted between May and August 2018 by Center for Research and Innovations in East Africa (CRI). The review sampled four case studies (Kenya, Malawi, Sierra Leone and Senegal), online interviews with fourteen (14) National Chapters across Africa (Uganda, Zambia, Tanzania, Mali, Togo, Zimbabwe, Madagascar, Rwanda, Ethiopia, Benin, Gambia, Somalia, Namibia and Swaziland) and in depth discussions with the FAWE Africa Board and the Regional Secretariat. We extend our sincere gratitude and appreciation to all the National Coordinators, National Chapter Board Members and Regional Secretariat staff involved. The review that led to this Strategic Plan was made possible with the assistance and cooperation of many individuals, institutions and partner organizations to whom FAWE is highly indebted. We are immensely grateful to the FAWE boards, staff and alumni, Ministries of Education and partners of the National Chapters that participated in this process. We are equally grateful to FAWE partners, UNESCO, UNICEF, Save the Children, USAID, Mastercard Foundation, and the Africa Network Campaign for Education for All (ANCEFA) for their time and contribution in shaping this process. FAWE is indebted to all participants who attended the Visioning and Validation workshops held in August and November 2018 respectively in Nairobi for their time and valuable input. FAWE would like to sincerely thank her partners Echidna Giving, Mastercard Foundation and the Kuwait Foundation for the Advancement of Sciences (KFAS)/ Al-Sumait Prize for their financial contribution to the 2013-17 strategic plan evaluation process and strategic planning for 2019-2023. FAWE recognizes the support of CRI, in developing this Strategic Plan. The team members included Dr. Jackline Nyerere, Andiwo Obondoh, Elijah Otiende, Dr. Milcah Chokah, Calleb Okoyo, Shem Osomo and Faith Nzama. The SP was developed under guidance and with technical support from Martha Muhwezi, Kelvin Omwansa and Lilian Nanzala and the rest of the staff from the FAWE Regional Secretariat as well as the wider FAWE network. To all the above, we are immensely grateful for your support that made it possible for FAWE to develop this strategic plan 2019-2023. 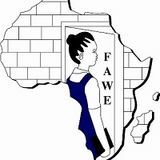 EXECUTIVE SUMMARY FAWE is a Pan-African Non-Governmental Organization (NGO) led by African women working towards equality in education across the continent. The organization was founded by five Ministers of Education in 1992 and supported by development partners within the Association for the Development of Education in Africa (ADEA). Since then, FAWE has engaged with governments, local partners, schools and communities to advocate for gender mainstreaming and influence the development and implementation of policies, and interventions to promote girls’ education in Africa. With its headquarters in Nairobi, Kenya, FAWE runs as a network of 34 National Chapters spread across 33 countries in Francophone, Anglophone and Lusophone Africa. Currently, the organization has members spread across the 34 national chapters and drawn largely from the education sector (Ministry of Education officials, teachers and other sector professionals). At the regional level, membership is composed of female ministers and deputy ministers of education, female vice chancellors and deputy vice chancellors, senior female education policymakers and prominent educationalists. The Regional Secretariat of FAWE is managed by a Regional Director who reports to an Executive Committee (EC). The EC reports directly to the Board, which in turn reports to the General Assembly, which convenes every three years. The Regional Director, working with technical, management and support teams at the Regional Secretariat, oversees the day to day operations of the Secretariat. At the National Chapter level, each national chapter has a Board of Management and secretariat headed by either a National Coordinator or Executive Director. such as NGOs, education networks, government agencies, and donors, based on their level of engagement with FAWE in furthering women and girls’ education agenda in Africa. This culminated in the development of a draft strategic framework, which was then discussed with FAWE regional staff, Board members, Ministry of Education officials of four (4) member countries (Kenya, Malawi, Sierra Leone and Senegal) and partners during the visioning and consensus building workshop held in Nairobi on August 20th to 21st 2018. However during the 2013-2017 Strategic Plan period, FAWE experienced a number of challenges including the ever-changing socio-economic and political environment in many African countries, the enormous task of motivating and retaining membership, the increasing difficulty of mobilizing resources to attain financial sustainability in a context of changing donor priorities, the demand for building up institutional capacity to increase effectiveness in implementing its mandate, and staffing constraints at the Regional Secretariat which affect the organization’s ability to support and closely monitor delivery and implementation of its strategy. partnership with policy-makers, educators, researchers, influencers and communities, will be guided by the following Vision, Mission, Goal and core values. values and competencies to achieve their potential. Guided by a robust theory of change (ToC) that spells out the long-term goal and desired outcomes of its planned interventions, FAWE will employ strategies that will enable the organization to cope with changes intelligently and efficiently. In order to achieve these broad strategic objectives, FAWE will develop a new business model which will ensure programmatic, organizational and financial sustainability for RS and NCs. The new business model will propel FAWE RS to work closely with member NCs to scale up successful models, deepen impact achieved in the previous plan period and deliver more change at more cost-effective and sustainable rates. New funding avenues will be explored and value for money framework mainstreamed. The key components of our new business model will consist of unrestricted funds kitty, strong partnerships and diversified funding base. The new business model when fully operationalised should address the major challenges witnessed in the 2013-2017 strategic plan implementation period. These units will be headed by Regional Managers (RMs), all reporting to the Deputy Regional Director. The seven-member team (RD, DRD and five Regional Managers will form the Senior Leadership Team at the Regional Secretariat. Implementation of the 2019-2023 Strategic plan will require a total of USD 30,122,242 plus dedicated and committed members, a focussed Executive Committee, a strong Regional Secretariat led by an innovative and visionary RD and supported by sufficient/qualified staff, and an internal culture that is empowering. communities. These engagements facilitated resource mobilization, policy influencing, shared learning and technical backstopping. However during the 2013-2017 Strategic Plan period, FAWE experienced a number of challenges including the ever-changing socio-economic and political situation in many African countries, the enormous task of motivating and retaining membership, the increasing difficulty of mobilizing resources to attain financial sustainability in a context of changing donor priorities, the demand for building up institutional capacity to increase effectiveness in implementing its mandate, and staffing constraints at the Regional Secretariat which affect the organization’s ability to support and closely monitor delivery and implementation of its strategy. Because funding from the RS was limited during this period, NCs did not align their priorities and resource mobilization strategies with FAWE RS. Despite these challenges, the organization maintained an effective working relationship with other like-minded organizations, which include sister networks, government ministries, NGOs, the African Union, and numerous donors. Their technical, financial and material support has enabled FAWE to deliver services to underprivileged girls across the Continent. This five (5) year Strategic Plan covers the period of 2019-2023 and marks a significant milestone in the life of the organization. The strategic objectives are built on what FAWE has learnt and achieved in the past. The SP intends to have girls and young women in adversity develop the skills and competencies needed to achieve and transform their communities. Significantly, the Strategic Plan is developed at a time when many organizations and governments in Africa are taking stock of their performance and are repositioning themselves to deliver goals 4 and 5 of the Sustainable Development Goals (SDGs) and the AU’s Continental Education Strategy for Africa (CESA). For the last 27 years, FAWE has been evolving, learning from its successes, challenges and environmental changes as it grows in size and profile. 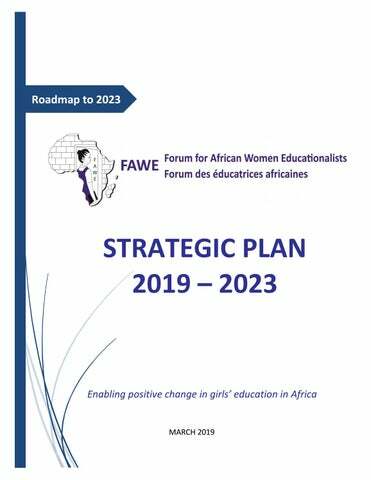 While the previous strategic plans made tremendous achievements in enabling African women and girls to access quality education, this fourth strategic plan (2019-2023) seeks to direct FAWE’s focus to imparting knowledge and inculcating skills and competencies that will enable African girls and young women to be at the forefront of driving the development agenda of the African continent. The choice of FAWE’s proposed interventions is informed by past experience, global trends, as well as the African Union (AU) and national governments’ priorities. partners, about the vision and mission, values and strategic direction of the organization. It defines a shared understanding of direction and philosophy through which all staff, members and partners will operate. Particularly, FAWE’s work will be guided by the agreed statements on future direction and defined strategic objectives, against which the organization’s successes and failures will be measured. Second, within the current environment in Africa where political, economic and technological changes have become more rapid and extensive, this Strategic Plan provides a basic framework to enable FAWE to cope with such changes more creatively. The strategic plan will enable FAWE members, Board and staff to make critical decisions and to act boldly in the face of the various adversities facing girls and women in Africa. Third, the strategic plan provides stability for FAWE’s operations and avoids sudden programme changes. At the same time, it is flexible enough to allow the organization to align to the dynamic operating context and realign to fit within the changing needs of the organization. 1.3 The Process of Developing the Strategic Plan The development of FAWE’s 2019-2023 SP was preceded by an evaluation of the implementation the expired SP (2013-2017). The evaluation identified the achievements, challenges, impact and lessons learnt. The threats and opportunities the organization faced were also identified. This evaluation established FAWEs’ relevance, effectiveness, efficiency, sustainability and the current status of the political economy in the wider context of technological and education sector trends. The evaluation further informed this new strategic plan by anchoring it in the African Union and national governments’ priorities as well as the SDGs and other global education sector dynamics. The views of FAWE members, Board, staff, representatives of the National Chapters, and partners undergird the analysis and ideas in this strategy. These were obtained through a participatory process managed by the Regional Secretariat between May and September, 2018. Consultative meetings convened by FAWE RS in Nairobi in August and late October, 2018 (bringing together the representatives from FAWE Africa Board, Regional Secretariat (RS) core technical teams and FAWE key partners) resulted in a consensus on the vision, mission, new theory of change and the key pillars of the SP. a) UN and AU ready to work with and support FAWE RS; b) Technical and financial resources available for the strategy; c) National Chapters have the capacity to roll out the plan; d) MoE and relevant state agencies ready to work and support NCs; and, e) Communities ready to drop negative social norms and harmful cultural practices. CHAPTER 2: STRATEGIC ANALYSIS 2.1 Context Analysis Currently, there are more girls and women out of school, facing extraordinary adversities compared to the last 10 years (UNESCO, 2016). The required skills and competencies needed to succeed in life are changing frequently, driven by rapid socio-economic and technological changes. Societal needs have become more complex, dynamic and require that girls and young women develop skills, values and competences that go beyond traditional academic knowledge. It is therefore imperative for FAWE to continue promoting education access, equity and quality that respond to these rapidly changing needs. FAWE’s new strategic push is to ensure that girls learn and feel safe while in school, acquire skills to effectively compete in the labor market, learn the socio-emotional and life skills necessary to navigate and adapt to the changing world, make decisions about their own lives, and contribute to the progress of their communities, nations and the world at large. FAWE believes that educating girls is a strategic development priority for Sub-Saharan Africa. Evidence shows that educated women tend to be healthier, participate more in the formal labour market, earn higher incomes, have fewer children, marry at a later age, and enable better health care and education for their children, should they choose to become mothers. The cumulative impact of female education can help lift households, communities, and nations out of poverty (World Bank’s Education Strategy 20201). Yet, despite the well documented benefits of educating women, 130 million girls between the age of six (6) and seventeen (17) are out of school, and 15 million girls of primary school going age — half of them living in adversity in Sub-Saharan Africa — will never enter a classroom (UNESCO, 2016). In Nigeria, for instance, there are almost five and a half million out-of-school girls, while there are over one million in Ethiopia. Furthermore, over 34 million out-of-school female adolescents are missing out on the chance to learn vital skills for work and survival. The slow educational progress for African girls will have lifelong effects, as almost a quarter of young women aged 15-24 today (116 million) in Africa, who have not completed primary school, lack skills for work. 2.2 The Momentum to 2023 Education systems across Sub-Saharan Africa (SSA) have made tremendous progress in increasing the number of children enrolled in primary schools over the last two decades since the launch of the Millennium Development Goals (MDGs), and later the Sustainable Development Goals (SDGs). The EFA Global Monitoring Report (2015) and the World Bank’s Education Strategy for 2020 have both drawn attention to what they term as the crisis of “schooling without learning” across developing countries. Pritchett and Banerjee, in their 2013 article, warn that the learning crisis is “both deep and widespread” and call for nothing short of total systemic transformation of education systems. In the same Vein, the African Union’s long-term development blueprints (Agenda 2063) and CESA (2016/2025), as well as the education sector plans by many African countries highlight the importance of quality basic and technical education in enhancing the overall quality of the region’s human capital and socio-economic transformation prospects. In this context, it goes without saying that FAWE must re-strategize to ensure that the girls and young women it supports access quality and relevant education that equips them for today’s workplace. The global compacts, regional and national development plans and sector specific strategies provide FAWE a perfect platform for pushing its agenda of enhancing girls and young women’s equitable access to relevant education of good quality. According to UNESCO GMR 2016 (Global Monitoring Report), the ‘learning crisis’ of our time is eroding significant gains in enrolment. So far, the enrolment gains are not translating into actual desired learning outcomes for millions of school children, particularly underprivileged children. An estimated 130 million children worldwide are attending school but do not attain even the most basic numeracy and literacy skills. This learning crisis provides FAWE additional opportunities to re-focus its actions for African girls and women on both enrollment and learning outcomes, so that they can acquire the 21st century skills and competencies necessary to navigate and adapt to the changing world. FAWE believes that “growth, development, and poverty reduction depend on the knowledge and skills that people acquire, not necessarily the number of years they sit in a classroom. It is for this reason that FAWE will make a paradigm shift in girls’ education and training of young women by focusing on actual learning outcomes, such as competencies for the world of work, values and life skills necessary for them to participate in the job market and to contribute to their communities and societies. 2.3 Stakeholder Analysis Figure 1 provides an outline of FAWE’s stakeholders in Africa. In addition to cultivating new partnerships through stakeholder maps, the organization will continue to maintain and sustain healthy relationships with organizations working to improve girls and young women’s education in the region. At the core of FAWE’s new business model is the partnership strategy which will continue to be enhanced and refined every six months in response to emerging trends, new programing needs, and expectations from our strategic allies. is a great asset to the network. address the crisis of “schooling without learning” by calling for nothing less than total systemic transformation of education.  There is great potential for FAWE to expand and increase its membership pool to include all professional women interested in education and reskilling of girls. Weaknesses: – internal factors likely to Threats: - external factors which may affect, hinder or frustrate delivery of the hinder or undermine delivery of the strategy strategy  Board members and secretariats in some  Ever-changing government priorities national chapters have limited capacity to mobilize adequate resources and build effective partnerships. advisory support to national chapters. is likely to remain favorable over the SP period. (CDF) in Kenya for example. expensive whenever there is urgency. same mission and competing for the same resources. 3.4 Our Strategic Objectives FAWE will endeavour to achieve the following four strategic objectives during the strategic plan period. 3.5 Our Key Result Areas Aligned to the four strategic objectives above, the eight strategic results or pathways to change for this plan period will include: i. 3.6 Our approach Informed by the regular political economy and education sector analysis, FAWE will adopt an adaptive programming approach throughout the SP period in order to remain responsive to contextual changes, address emerging issues, mitigate cause/effect of girlsâ&#x20AC;&#x2122; and womenâ&#x20AC;&#x2122;s education, promote the rights and welfare of girls and women in adversity and empower them to be self-reliant and productive members of their societies. Consequently, the organization will blend this approach with the rights-based approach to the development in order to focus on championing enabler rights of girls and women in dynamic environments around Africa. FAWE will seek to remain a learning catalyst, facilitator of change processes and innovator of sustainable gender responsive interventions during this strategic plan period. In order to deliver this SP, FAWE will be guided by the new business model, to focus on mobilizing financial and human resources within and out of Africa through strategic partnerships with international development partners, UN bodies, regional economic communities (RECs), national governments, local communities, businesses, philanthropists and FAWE beneficiaries. CHAPTER 4: OUR STRATEGIC FOCUS AND ACTIVITIES 4.1 Our Theory of Change Working closely with strategic partners, state agencies, families, teachers, local communities, alumni, members and other key stakeholders, the FAWE network will create and contribute to positive change that is favorable to girls and young women in their societies across Africa. At FAWE, we believe that when every girl and young woman is provided with opportunities to nurture skills and competencies then they can achieve their full potential; and that appropriate and holistic approaches to girls’ and women’s issues are essential to create progressive, inclusive and safe environments for them to become useful members of their societies. Our outcome statement on girls and women in Africa is empowerment through education and training with relevant knowledge, skills, values and competencies needed to achieve their full potential. This will be realized through four intermediate outcomes: improved access to quality education and training; responsive systems, plans and budgets; robust research and evidence; a vibrant and capable network. We will pursue eight pathways to these outcomes as outlined in Figure 2 and detailed in the subsequent section on Key Result Areas (KRAs) and Possible Interventions. Key Performance Indicators (KPIs) for each of the KRAs are outlined in Annex I in Chapter 6.
campaign plans aimed at addressing harmful cultural practices affecting girls/women such as early marriages, female genital mutilation (FGM), teenage pregnancies and school related gender based violence. FAWE will further engage political, religious, traditional and opinion leaders in elaborate community driven campaigns to influence them to eradicate harmful cultural practices. FAWE will come up with alternative approaches to rites of passage and other sustainable ways of promoting education of girls and women. In addition, FAWE intends to work with local groups for mothers, youth and fathers to put pressure on communities to provide girls, especially those living in adversity, with opportunity to learn and feel safe while in school, complete all levels of education with skills to effectively compete in the labour market. Efforts will be made to re-model the existing mother groups so that they are all inclusive. The organization intends to join/form local networks and work with like-minded organizations to promote community approaches that empower girls and women to take actions in improving their plight and fighting negative practices targeted at them. FAWE will explore the use of participatory approaches such as REFLECT (Regenerated Freirean Literacy for Community Empowerment techniques) as a proven community empowerment approach. FAWE will work to foster and promote girls’ and women’s agency to mitigate obstacles stopping them from accessing quality education. SO 2: To advocate for the integration of gender responsive approaches and policies in African education systems in order to inculcate skills and competencies in girls and women to enable them to contribute to and transform their societies. based approach to programming, gender issues and financial management. Another priority area of capacity building will be in policy, planning, budgeting and data literacy so as to facilitate the NCs engagement in the local education groups (LEGs) which is critical because they are the education sector coordination and dialogue mechanism that is at the core of sector planning and piloting at national level. To effectively deliver the capacity building mandate, FAWE will strengthen the institution by recruiting skilled and experienced professionals to drive the agenda of strengthening the national chapters. Furthermore, FAWE will tap into the existing pool of experienced members and Alumni, at the national and regional level to provide services at limited cost or on pro-bono basis. b) Membership mobilization and leadership development: - FAWE has a pool of experienced and qualified members as additional resource persons to support strategic plan implementation and governance. During this strategic period, FAWE will create new national chapters, develop a tracking system for alumni and intensify the recruitment of members at the regional and national levels. The regional secretariat and national chapters will have set targets and the national chapter with the highest paid up membership will be awarded during the General Assembly. Membership will be open to professional women from all sectors, particularly those with a track record of ensuring that girls and young women in Africa acquire relevant skills for the world of work. Some of the interventions FAWE plans to undertake are recruitment and maintenance of more members and sustaining the interest of current members by engaging them in FAWE activities, organizing annual marketing campaigns to raise FAWEâ&#x20AC;&#x2122;s profile, organizing outreach activities targeting relevant networks and professional associations e.g. teacher unions, law societies, association of engineers and education coalitions among others. Through membership drives and mobilization, during this plan period, FAWE will seek to increase and expand its membership base across Africa. FAWE plans to aggressively bring on board new members and revitalize the FAWE passion. The organization will also seek to improve resource mobilization, policy development and oversight/management skills for regional and national boards. with national authorities and support them to plan for and carry out relevant activities throughout the year including recruitment of more members. NCs will be requested to host alumni associations for a period of two years and engage them in chapter activities and other relevant local campaigns on voluntary basis (pro-bono) as a way of giving back. d) Using FAWE new business model to mobilize new resources: FAWE intends to increase her resource base by carrying out a series of fundraising events, mapping out local and international donors, and proactively engaging and linking with local donors to support girls’ and women’s education. FAWE will tap into the recently launched African Girls Education Fund (AGEF) to leverage on her (FAWE’s) resource mobilization. In this strategic plan period, FAWE will use a road map of three steps determination of resource gaps, analysis of external environment and matching potential donors with unfunded outcome areas in the new business plan. Details of how to expand our resource base over the plan period are contained in the new business model in Chapter 5. 5.1 Leadership and Management Structure for 2019-2023 Strategy The implementation of the 2019-2023 Strategic Plan calls for commitment by the entire network, RS, NCs, Boards, members and alumni to enhance the organization’s operations. Specific decisions, with far reaching consequences, will be made to ensure that the organization remains relevant to its stakeholders. 5.1.1 FAWE Boards of Management The organizational structure has been reviewed for the purposes of strengthening it to be responsive to the needs of members and to ensure effective implementation of this strategy. As a key enabler for effective strategy implementation, the structure has been aligned to the organizational strategic goals and objectives. The Africa Regional Board and NC boards has been reorganized to include professional women from different fields with interest in empowerment of girls and women. The proposal is to recruit and include representatives from chambers of commerce and industry teacher unions, professional societies and associations, the humanitarian sector and alumni. The NC secretariats will be expected to file their quarterly and annual reports with the regional secretariat; while on their part the NC Boards will hold policy discussions with the regional Boards every six months through skype conference calls and webinars. In this strategic plan period, the position of Executive Director will be renamed as the Regional Director, based on the current trends in all regional organizations based in Nairobi. The Regional Director will remain Secretary to FAWE Africa Board. possess an executive profile and competence to cover programme and administrative support functions. This arrangement will free the RD from spending too much time on tracking internal controls and concentrate on strategic functions like networking, partnership building, donor relations, high-level policy engagements and representation. Based on the need to implement our goal and objectives, financial capacity, lessons learnt, the new role of facilitator and capacity builder, the organization will establish five departments or units at the regional secretariat namely: i. Finance and Administration These units will be headed by Regional Managers (RMs), all reporting to the Deputy Regional Director who will be reporting to the Regional Director. The seven-member team (RD, DRD and five Regional Managers will form the Senior Leadership Team at the Regional Secretariat. For this reorganization to be cost-effective FAWE regional Board will facilitate and undertake an HR audit (Job Evaluation) of the available skill-sets and capabilities among the current staff members at the regional secretariat within the first six months of this SP implementation. The audit will also help to define the positions and to come up with the required job descriptions for each of the positions. The proposed core functions under each of the five divisions or units will be as outlined in the Table 2 below. building Strategic partnerships with AU, RECS, UN agencies, CSO networks, foundations and other relevant Africa and global partners. building will cut across the three four Advocacy and Research and KM Unit (2) Communications Unit (3) i. Advocacy Coordinator i. Research and Evaluation Coordinator ii. Officers under each of the Coordinators/Units will be determined based on need, required expertise and available resources or active projects. Figure 3: Illustration of the new FAWE Regional Management Structure. supported by the Regional Secretariat. The National Chapters will have National Boards elected by National Assemblies which will be expected to hold their meetings once every year. The National Assemblies will bring together all members and representatives of alumni. Such assemblies will be chaired by Chairpersons of National Boards, their deputies or designated members and technically supported by National Secretariats. The structure, composition and roles of different officers of National Secretariats will be determined by National Boards based on availability of resources and active projects, but at the bare minimum there should always be a National Coordinator and Finance Officer. The FAWE network structure is shown in Figure 4 below. sustainable rates. The new business model is premised on the beacons and issues in Figures 6 and 7 below. The model will also help FAWE to develop strong relationships with stakeholders at global, regional and national levels. FAWE commits to pursue a diverse funding approach to fully finance this Strategic Plan: the full array of which will include membership fees or subscriptions; fees from technical services e.g. research, trainings and other consultancies; sales from education and research publications; rental income from office space; income from hospitality and conference facilities, income from reserves and endowment funds; grants from alumni and members, crowd funding (through social campaigns), donations and gifts from stakeholders and supporters; cost recovery measures; grants and partnerships with local businesses; subcontracts, consortium and international aid. 5.2.1 Expanding FAWE Resource Base Building from FAWE’s cumulative experience, the organization intends to increase its resource base by carrying out a series of fundraising events, mapping out local and international donors, and proactively engaging and linking with local donors to support girls’ and women’s education. FAWE will leverage on the recently launched African Girls Education Fund (AGEF) to support its resource mobilization strategy. In this strategic plan period, FAWE will use a road map of three steps: determination of resource gaps, analysis of external environment and matching potential donors with unfunded outcome areas in the new business plan. Building from the road map above, FAWE will reshape its profiles and visibility to re-position itself as an organization of choice with local and international partners. FAWE will continue to apply and improve on the hybrid resource mobilization plan that was initiated during the previous strategic plan period, during which time the regional office undertook individual and collaborative (joint) initiatives with member NCs. The following resource mobilization and partnership opportunities will be considered by RS and the national chapters moving forward. •Joint proposal writing or consortia •Joint advocacy programmes •Bi-lateral partnerships with INGOs •Approach corporates, private foundations and individual philanthropists for grants •Bidding or applying for research, training and other consultancies • Build institutional capacities •Create resource mobilization or business development units with full time staff.. •Diversify funding sources. 5.2.2 Seeking New Resources The implementation of the Strategic Plan 2019 – 2023 will require a total of USD 30,122,242 (Thirty Million, One hundred and Twenty Two thousand, Two hundred and forty two). A number of strategies will be applied to mobilize these funds. Internally, FAWE will seek to raise USD 6,024,448 by expanding its self-financing sources including; enhancing membership drives introduction of membership fees for different categories; expand rental income by constructing Phase 2 of FAWE house; alumni contributions; fundraising events like road shows, dinners/cocktails; establishing a consulting arm to undertake research and provide other relevant technical services, partnerships with think tanks or research institutes; organizing and hosting pay-as-you attend technical/learning conferences and workshops; joining relevant consortia, networks and partnerships with like-minded institutions. Externally, FAWE will seek to raise USD 24,097,794 to support delivery of this SP. FAWE will increase efforts to bring on board new Donors and strengthen relationships with the current donors. become a challenge to many organizations due to the global economic down turn. Resource mobilization will remain a significant component of this strategy because it will influence its successful implementation, delivery and impact. 5.2.3 Illustrating the New Business Model The Figure 8 below, which has four key pillars â&#x20AC;&#x201C; building a strong profile, institutional strengthening, internal and external sources - represents our new business model. Renting and leasing property/space; providing catering services; training and consultancy; building reserves; investments; sales of publications; and cost recovery measures. Others include identification of donor priorities and aligning them with FAWE priorities; seeking support from donor champions; identifying, profiling and mapping African philanthropists; lobby for referrals by partner governments, organizations that we already work with or other donors. 5.3.1 VfM Policy Objectives The aim of this framework is to provide an effective input-process-output analysis for FAWE RS to ensure that its assets and resources are used economically, effectively and efficiently so that the organization can improve outcomes for the beneficiaries and other stakeholders and maintain evidence for what we are achieving or have achieved. At the outset of delivery of this strategy, we will focus on the economy, effectiveness, efficiency and equity indicators, understanding the initial inputs and activities that should be guided by specific VfM indicators and will continue throughout the life of the strategy. During implementation, FAWE RS will largely be driven by focus on results and prudent management of funds. Below is an indication of how and where FAWE RS will be able to provide VfM for donors as well as several indicators that will be considered in our monitoring approach. The following set of objectives will drive VfM application throughout this plan period. a) Develop use of business intelligence to inform our decisions by better understanding of our cost drivers, how these relate to performance and compare to others. b) Integrate Value for Money principles within existing governance, management, strategic and operational planning and review processes. c) Ensure all staff understand what Value for Money is and how this can be achieved. Enable and encourage them to see Value for Money as part of their routine activities. d) Improve our approach to procurement and obtain maximum benefit from goods, works and services procured. e) Promote and embed a culture of continual improvement and Value for Money. f) Actively demonstrate our commitment to Value for Money to all stakeholders. Definition Economy – is careful use of resources to save expenses, time or effort. Description Continually improve service offerings, utilise resources fully, and realise potential savings from economies of scale and scope in our programmes. Efficiency Efficiency – is (inputs to delivering the same outputs) level of service for less cost, time or effort. FAWE RS to work with the right international and local implementing partners, and adopt the right systems and processes. FAWE RS already established relationships with key national and regional stakeholders and drivers of change will ensure efficiency of our activities. FAWE RS to focus on setting measurable output milestones and outcomes. Achieve lasting change in communities, institutions and behaviour of individuals, leaving behind systemic change. Ensure that measurement systems, programme analysis and the understanding of education systems, look beyond the implementation period and achieve sustainable outcomes. Ensure that programme impacts are not achieved at the expense of other values. Ensure that benefits of FAWE RS are fairly distributed by undertaking systemic interventions that are inclusive of the poor and marginalised women. Pay specific attention to the inclusion of women and other marginalised groups, who are particularly underserved but also provide a huge potential for contribution to transformation of their societies if targeted appropriately. 1. Average cost per partnership 2. Partner leverage ratio 3. % partnerships resulting in sustainable practice change 4. Satisfaction rating of partners and national chapters. Effectiveness – is delivering a better service or getting a better return for the same amount of expense, time or effort. 1. % of beneficiaries that are poor, female, young, old, rural, peri-urban and urban. 5.3.3 FAWEâ&#x20AC;&#x2122;s Approach to VfM Different approaches to measuring VfM will be appropriate at different stages of the strategy and useful VfM evidence will require a range of measures. It is envisaged that quantitative and qualitative data on the VfM indicators will be collected, analysed and results interpreted on an annual basis. FAWE RS will take a parallel but mutually reinforcing approach to measure VfM achievement, at regional and national chapter level, programme level and at partnership level. At regional level, data on VfM indicators will be collected to measure the overall strategic performance. At national chapter level, data on VfM will be collected to reflect the partner scenario in achieving or seeking to achieve VfM in terms of the culture of the chapter, adopting good practices, clearly defining the chapterâ&#x20AC;&#x2122;s aims, strategies and policies, institutional accountability, together with appropriate controls and oversight. At the level of FAWE RS, the assessment of VfM will take many forms and will include benchmarking an activity against similar activities in other organizations by reporting on indicators. 5.3.4 VfM Reporting Once in a year, in the last quarter of the year, FAWE RS will constitute a team with adequate orientation to VfM at a minimum. The VfM reporting tool will be completed by a team comprising of four (4) staff with skills in the following: VfM orientation, MEL skills, Programme and Finance Management. To complete the report, a score will be filled in each statement that is applicable and relevant. Each answer should be supported by evidence and examples, to be summarised in the supporting Value for Money Report. Other qualitative observations should also be recorded in the report to corroborate evidence. In preparing their answers, the evaluators should conduct interviews with relevant FAWE RS staff and review relevant FAWE RS documents such as finance manuals, project management or operations manuals, intervention strategies, and any other relevant documentation. Ongoing learning and adaptation  Emerging lessons from implementation - what is working and why? What is not working and why?  What and how local partners and schools are learning from FAWE interventions and how these lessons are being applied to improve learning.  Have they adapted any approaches or activities from what they have learnt? Has that worked or is further adaptation needed?  How are the key learnings being documented and shared with partners and across the network? policy and programme decisions. When this happens, cost drivers will be assessed and best value for the network maintained at all times to ensure that NCs, local partners and schools can take up some, if not all, relevant FAWE interventions during and after the strategy. 5.5.8 Financial Sustainability: During the plan period, FAWE (both RS and NCs) will purpose to carry out aggressive resource mobilization activities with the aim of raising required funds as guided by the new business model for successful delivery of this strategy. FAWE, through its various partnerships and networks will also advocate for AU, UN agencies, Ministries of Education, local NGOs, colleges and schools to prioritize activities and set aside or ring-fence some targeted resource envelopes that will support education or training of girls and young women. 5.5.9 Other Sustainability Measures will include: Beginning all projects with the end in mind by designing all projects with in-built exit strategies; starting new chapters/reviving collapsed chapters and calling all chapters to action as they align their plans to this regional strategy; encouraging peer learning among NCs; integrating emerging issues as appropriate; revamping alumni and activating all membership categories. #/% of policies Sector reformed analysis; policy # & type of issues papers; emerging from technical these reforms working groups and dialogue forums. Staff Costs(to be inbuilt on Project costs). Annex 3: Glossary of FAWE Interventions in the Previous SP (2013-2017) a) FAWE’s comprehensive scholarship packages, which enable bright students from poor backgrounds to enroll in school, stay on to complete the school cycle at all levels, and perform well in national examinations. Every year, about 17,000 girls and boys benefited from FAWE’s bursary support. b) FAWE’s Tuseme (Let us Speak Out) youth empowerment model, which enhances girls’ self-esteem, leadership, social and life skills, and promotes a positive attitude amongst boys towards girls’ education. Tuseme plays a key role in raising girls’ knowledge about their sexual and reproductive health to enable them to make informed decisions about their sexual and reproductive health. c) FAWE’s Gender-Responsive Pedagogy (GRP) develops the skills of teachers and school administrators, supporting them in attending to the specific needs of girls and boys. Since 2005, over 20,000 teachers have benefited from FAWE’s GRP training, which contributed to the improvement in girls’ retention and performance. d) FAWE’s Science, Mathematics and Technology (SMT) programme. Since 2005, over 15,000 students have benefited from this programme, resulting in higher rates of girls’ participation in SMT subjects, improved test scores for girls, improved attitudes amongst teachers towards girls’ abilities, and positive attitudinal change amongst girls towards these subjects. e) FAWE’s mothers’ clubs, which enable women to advocate at the grassroots level, mobilize community support, and raise awareness on the socio-economic benefits of girls’ education. f) FAWE’s Technical and Vocational Education and Training (TVET) - “Economic Empowerment of Girls in Post-Conflict Situations through Vocational Training” which provides out-of-school girls with the opportunity to acquire technical, vocational and entrepreneurship skills traditionally reserved for males and incorporates entrepreneurship training and grants provision to graduates who cannot enter the formal employment sector. TVET also provides scholarships for continuing education, establishes strategic alliances among key stakeholders, facilitates the creation of graduates’ associations, and conducts policy advocacy and community mobilization activities (Source: FAWE Strategic Plan | 2013–2017 pg.14).